PHEW! Here we are just short of a year later. How have the last 10-or-so months been for you? Fantastic! Being able to work full time on this project for the last year has been a joy. Not without the occasional hiccup or stressful moment, but that's all part of game development. Do you feel that Kickstarter allowed you to provide a polished product? Absolutely, there's so much I've done with the game that would not of been possible otherwise. I think the two standout elements are the character art and voice acting. If it was not for the success of the Kickstarter, the game would be stuck with a inferior, dull character art style. Instead, the extra funding allowed me to hire somebody who excels at character development....Karl's characters injected a lot of personality into the game and I couldn't be happier with them. In turn, this made the job to find voice actors easier. Once they had the script and saw those character pieces they knew exactly what I was after. Thankfully the whole process went smoothly and I'm also incredibly happy with the the quality of the voice acting in the game. How was your development process different this time around compared to your previous projects? The scale is the main factor here. My previous projects have all be much smaller games, some designed to be free or barely more than free. Concrete Jungle was the biggest to-date by far, and required more of everything: more planning, more art, more design, more decisions to be made... you name it. My development process has been honed over the few years I've been doing this now. For example, when I started out I didn't put too much stock into prototyping ideas. I naively thought if an idea was good in my head it would surely translate to a good game. The early stages of CJ (before the Kickstarter campaign) taught me otherwise, it went through about 4 or 5 completely different prototypes before arriving at the base design. Moreover, a lot has changed throughout the year to help the gameplay really find its groove. Some of the best feedback and ideas came from the backers themselves. I'd advise new developers to keep an open mind about their project's gameplay throughout development. One thing I've found over the years is that it's easy to tunnel-vision your way into working on an idea that in the end falls a bit flat. Sometimes early in development, you imagine playing an idea in your head and it's the best thing ever, but months later when that idea becomes reality it falls a bit flat. Let’s talk about scale. What process did you use to prune away ideas that, while possibly productive, still would have been too big for this project? A combination of early prototyping and just having enough experience to roughly know how much work is involved. Sometimes you'll think of ideas at later stages that ideally should of been included from the start, and it's tricky to decide whether to go for them or not. There's no definitive yes or no answer, so it very much depends on factors like time and amount of work needed. 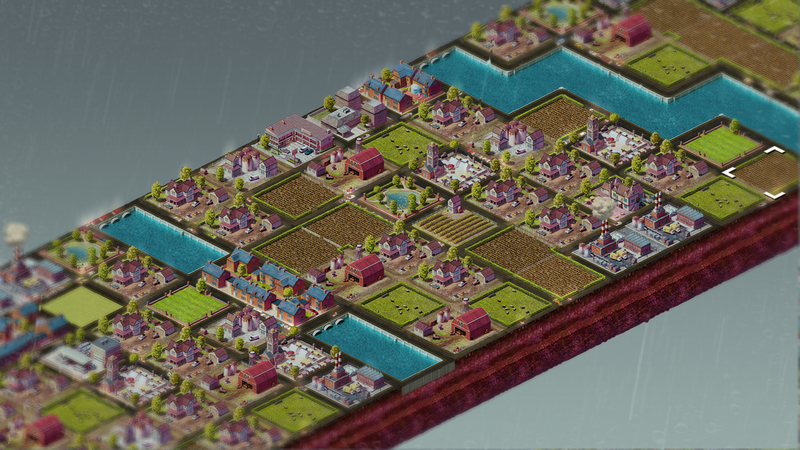 For instance, the addition of the rain weather effect was a very late addition that I made about 3 1/2 weeks before launch. It was a cosmetic addition that wouldn't require a huge amount of work so it made sense to add it, even at that late stage. How well were you able to adhere to your initial schedule at the outset of the campaign? Obviously development ran a little long... How much did preplanning help you? The milestones for straightforward elements weren't too hard to hit. I had all the buildings done in a reasonable amount of time, for example. It goes without saying that the parts of the project that were harder to plan for ended up taking the most time. Early on in the year it became obvious that I was going to have to review some of the mechanics. There were a few problems that I had not foreseen at the time of the campaign, mostly in late-game gameplay. With some help from backer feedback from the preview version I was able to mould the game into the experience I wanted it to be. This, unfortunately added a couple of months to the schedule, but the game is much, much better for it! I think those things will always crop up, unless you have a project which is basically finished when you do the Kickstarter. What I didn't want to do was plough forward and be blind to problems. While in development, did you reach out at any point in an attempt to overcome a particularly vexing problem? There were a couple of times I asked my backers to vote on things. Not necessarily because I had unsolvable problems, but because I wanted to make sure I was doing the right thing by them. Unsurprisingly, if you've sold people on the idea of backing your game, most are generally happy to support any decision you think is right for the project. How are players liking the game? I'm seeing some good stuff on Twitter. It seems to be well-accepted, which is great! I've had a few bugs to fix during the launch week, but dare I say it I think those have been squished now. Although I was always confident in the project, I've never been one to take the player's opinions for-granted. I was expecting a wave of 'I bought this thinking it was SimCity' complaints, and thankfully I'm getting far less of those than anticipated, I would guess due to the nature of how people seek out games these days such as through let's plays and streams. How did you decide to marry a card game with a city building/planning game? It just came about from a collision of ideas. 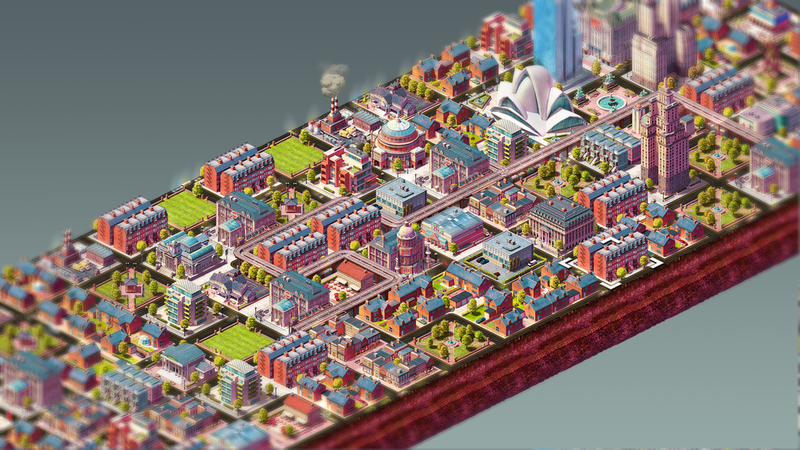 About two years ago I was still struggling to come up with big new ideas for the sequel to my game MegaCity (my first iOS game from 2011, which features the principal mechanics found in Concrete Jungle). One of the main limitations of the game was the random building list- an obvious solution was to give the player complete control over this, yet that takes away the challenge. I didn't want to get rid of the random element completely. Around that time, a friend introduced me to the tabletop card game Dominion. It then clicked how a deck-building mechanic could be the solution to MegaCity's problem in that it allows a certain degree of control but keeps the ordering random. It seemed like it could be a good combination! When did the RPG-ish mechanics come in? Honestly, I think it's because I just really like skill trees! These came in a few months after the end of the Kickstarter when I started putting together the 'versus' mode. I needed something special to nudge the players towards different play style and different characters each with their unique abilities is always a good way to go with this in terms of design. I had an idea I wanted to do this from quite early on in project, but didn't know how it would effect things until I got the first two characters working. I was a little surprised, but no less charmed, by the story element that you brought into the game… it helps that the characters are pretty endearing. What made you introduce a narrative to the game? A light hearted, humorous approach to the story was a must in my opinion. The game deals with the ridiculous notion that people are city planning competitively to screw each other over- it's hard to take that too seriously! The playable characters lend themselves really well to a story mode. The 'you-must-beat me-in-a-game-to-unlock-me' mechanic is a classic one, and I thought it would be perfect for CJ, too. Some of the later games can get really tough but, as the player builds up a repertoire of characters and abilities, they have an increasing variety of different tactics at their disposal. Do you think card games are rising in popularity? Hearthstone, the ubiquitous Pokemon/Magic the Gathering, Scrolls, Card Hunter, etc. Yes, and there are some fantastic ones out there. They have huge appeal because they present this great balance of randomness and control. Everybody knows where they stand with a deck of cards! I think I'll always find the mechanics behind these games fascinating (I was one of the people who spent most of their time in Witcher 3 playing Gwent.) Since the start of CJ I've thought about combining card mechanics with at least half a dozen other genres! Concrete Jungle was, in a way, a response to the disappointment a lot of us experienced with city building games like SimCity. Since we spoke last, Cities: Skylines has come in and largely filled that role as being a well executed game and amazing way to breathe life into the genre. What are your thoughts? Yes and no. I was very aware of that gap that SimCity left a few years back, but at the same time I didn't think a one-person developer was really capable of filling it. There were early prototypes of CJ that played a bit more like SimCity, but the mechanics I tried to keep from MegaCity were clearly incompatible with it. The prototypes ended up being too complex- sometimes seemingly simple limitations are a key part of what makes a game fun. Before the Kickstarter, I made the decision to actually not make CJ the 'indie SimCity' in terms of gameplay, but stick to it's roots and pursue something that was a bit unique. I think this was the right call as Cities: Skylines fills the city builder gap admirably, and CJ is it's own thing that plays completely differently. I still kind of want to make a traditional city building game, maybe I will someday, but for now I'm glad I've carved out a little niche for something quite new and unique with CJ. I personally am a fan of games that follow the “broad but deep” mantra. Do you feel that this can apply to Concrete Jungle? Yes, or at least this is what I was going for with my design philosophy on the project. A lot of ideas were rejected in order to keep things simple on the surface. The card mechanic plays into this really well as you can keep adding new ideas and mechanics that bring about new strategies through these cards while keeping the base game the same. Now that the game is out, I understand that you plan to support it for a little while with new content. Anything specific you’d like to share? I have no specific dates yet, but I'm going to be working on a free update that adds 30 new buildings and a 'night mode' that will provide a cool new look for the game! Concrete Jungle is available on Steam and itch.io. For more about Concrete Jungle and Cole Jefferies visit his website.